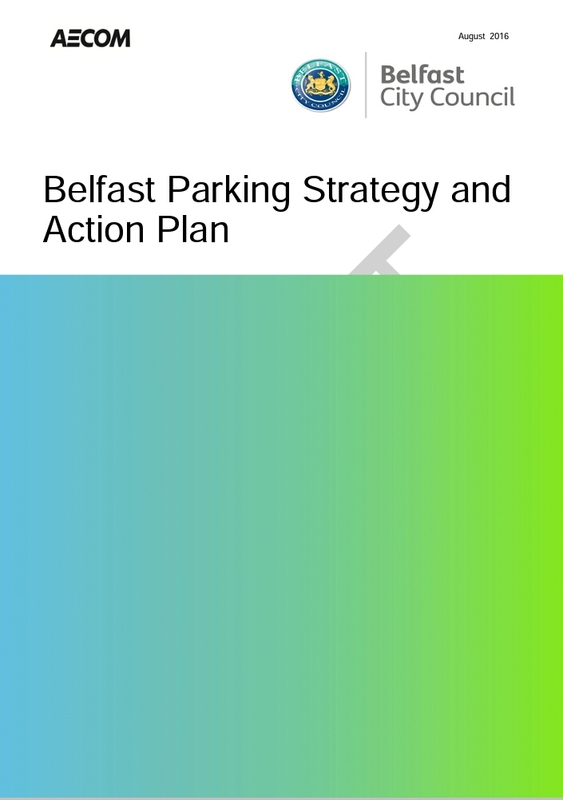 Belfast City Council has produced the draft for the Belfast Parking Strategy and Action Plan. You can have your say here. Last year I blogged about the various issues surrounding parking in central Belfast. I am pleased that Belfast City Council is thinking along the same lines and in many ways goes much further. In the draft, put together by AECOM, there are various parking management tools, such as live parking information boards, online payments, phone apps, variable tariffs to discourage all day on-street parking, and encourage turnover by automated parking bay monitoring. These tools will be employed to make more efficient use of parking spaces, to reduce congestion due to people circulating for spaces and better monetise the available spaces. The draft recognises the blight caused by off-streat surface car parks; the invitation to drive by over-provision of parking; the congestion and harm to the local environment caused by excessive road traffic; the burden placed on local residents by all day parking by city centre workers. My blog post grossly underestimated (by 2/3) the amount of parking available. There are 40,000 spaces. Worrying is that my total was derived from official Belfast on the Move reports. If the Government was unaware what was happening on the street how could they ever address it properly? The draft makes for positive reading from a cyclist’s point of view. Belfast Bikes docking stations are to be situated at or very near new multi-storey car parks around the city’s inner ring. Cycle parking will be increased across the City Centre, with security and covered against the weather. Residents only cycle parking will be provided. A feasibility study will be carried out for a Cycle Hub in the City Centre. Active Travel and Park and Ride schemes are to be promoted to discourage people using cars to access Belfast City Centre. Cycle infrastructure and parking will be enhanced in “quality and volume”. Cycle parking at railway stations is to be increased to encourage bike-train commuting to Belfast City Centre. Belfast City Council fully signs up to the NI Bicycle Strategy and so this Parking Strategy will be used to deliver the aims of the Bicycle Strategy. Planning applications for city centre developments will need to show “sufficient” amounts of cycle parking. It has to be noted that some of these points cannot be delivered by Belfast City Council alone, but need involvement from various NI Government departments. 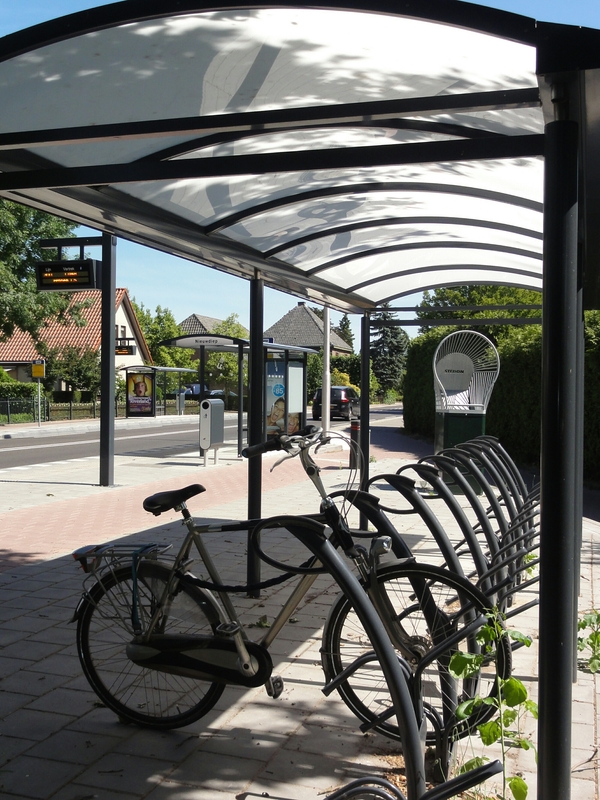 For instance, providing and increasing the number of covered and secure bicycle stands at (for argument’s sake) Lurgan railway station is outside Belfast City Council control. The building of cycle paths, Dutch-style roundabouts, etc, will be led by the Department of Infrastructure. Whilst their Cycling Unit’s heart is in the right place, the budget definitely isn’t. In Northern Ireland regional bus travel is important, because the railway network was dramatically reduced in the 1960s on the recommendations of the Benson report. I’d like to see more cycle parking at bus stations and important halts outside Belfast, but also along the Belfast Rapid Transit routes, and so encourage bike-bus as an alternative to car travel. The draft has one central failing. Having recognised that a significant proportion of parking is always vacant, it then does not set about a strategy to reduce provision to more realistic levels. It moves surface spaces to new multi-storeys, but never at a significant reduction of overall numbers. The only way to stop cars entering the city centre and to relieve congestion is to stop providing for cars. Encouraging uptake of active travel and increasing patronage of public transport is doomed if car use is not discouraged. Similarly, environmental benefits will fail to realise if Belfast city centre continues to roll out the red carpet for car drivers, be they commuters or leisure visitors. The draft should therefore contain targets and a timetable for reducing number of spaces. A reduction of 30% (wiping out the excess provision) in 10 years overall is ambitious, but achievable. If, for instance, a 500-space Park & Ride facility were to be opened at Knockmore Halt in Lisburn, then the number of Belfast city centre spaces should be reduced by at least 500, and ideally by many more to achieve real reduction. Also, the draft doesn’t fully recognise that on-street parking hinders rolling out of cycleways across the city. Dublin Road, for instance, should have a separated cycleway considering the volume of traffic and numbers of cyclists. Such a path cannot be accommodated because of on-street parking on both sides of the one-way road. Similarly, cycleways along Lisburn Road and Albertbridge Road are impossible as long as on-street parking is considered more valuable than moving people. The draft strategy has highlighted the obscene over-provision of car parking space in Belfast city centre. It sets out a variety of good measures to make more efficient use of the available provision. The strategy sees cycling as a viable transport alternative to 1) replace car commuter journeys; 2) to move people from outlying car parks to their place of work in the middle of town. The strategy fails to address the over-provision adequately, and more effort should be made to reduce the number of spaces available.